The materials available through this website and other websites owned or provided by Shaggy Flores™ and South of Harlem Multimedia™ (individually and collectively, known as the “Website”) are the property of Shagggy Flores™, and are protected by copyright, trademark and other intellectual property laws. You may view, copy and print pages from the Website only for personal use, provided that you maintain all copyright, trademark, and other proprietary rights or notices. You may not otherwise use, reproduce, download, store, post, broadcast, transmit, modify, sell or make available to the public content from the Website without the prior written approval of Shaggy Flores™. All contents of shaggyflores.com are: Copyright 2012 by Shaggy Flores for South of Harlem Multimedia™ and its suppliers. All rights reserved. 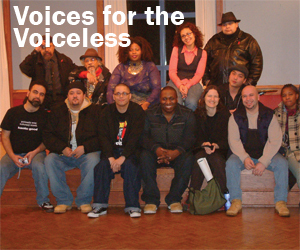 SHAGGY FLORES™, SOUTH OF HARLEM™, SOUTH OF HARLEM MULTIMEDIA™, VOICES FOR THE VOICELESS™, VOICES FOR THE VOICELESS POETRY™, VOICES FOR THE VOICELESS CONCERT™, VOICES FOR THE VOICELESS DIASPORA™, ¡PUNTO!™, ¡PUNTO! POETRY™, ¡PUNTO! POETRY PROJECT™, INVISIBLE ORDER OF THE CHANCLETA™, all the logos, all their derivatives and other related trademarks, are trademarks of Shaggy Flores and may not be used without permission. SHAGGY FLORES™ AND THE VOICES FOR THE VOICELESS™ families of related marks, images and symbols are the exclusive properties and registered trademarks of SOUTH OF HARLEM MULTIMEDIA™. ANY USE OF THE SHAGGY FLORES™, VOICES FOR THE VOICELESS™, LOUIS REYES RIVERA LIFETIME ACHIEVEMENT AWARD™, ¡PUNTO PROJECT!™, INVISIBLE ORDER OF THE CHANCLETA™, brands and any other website related brands contained within, without the express permission of Shaggy Flores and South of Harlem Multimedia, can/will result in legal action.